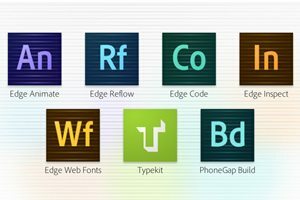 Adobe Edge: Does Adobe Finally Understand Developers? Adobe and web design. They have a complicated history. I can never quite tell if Adobe is an estranged partner of web developers or an active advocate. Are they focused on empowering developers or replacing them with clunky WYSIWYGs? Today we’re going to take a look at Adobe Edge Tools and Services, a new initiative from Adobe that might be enough to change your mind about how Adobe views coders. Adobe has always had a bit of an odd relationship with web design. Their flagship app, Adobe Photoshop, was never intended to be used as a tool to build websites, yet it has become the standard place to build graphics for the web. Then you have products like GoLive and Dreamweaver, the former of which is long dead and the latter of which receives mediocre reviews at best from developers. Most of us avoid it entirely. It seems like Fireworks is the only decent true web design tool that Adobe has in the Creative Suite, but it has a sort of cult following, only the enlightened few drop Photoshop and pick it up instead. Historically, Adobe has had a customer base full of designers. They simply haven’t ever understood or even really targeted developers. By limiting their offerings to WYSIWYGs like Dreamweaver and Muse, which are aimed at allowing users to focus on design and ignore code, Adobe made a clear statement: we don’t care about coders. In fact, it’s more than that, Adobe has completely undermined coders by focusing so heavily on building crappy products that seek to eliminate hand coding from the web design process. They seem to see front end web coding as this annoyance that should be eliminated, not as a legitimate and valuable profession. Meanwhile, the millions of us who actually prefer to code websites by hand rather than have a piece of software spit out an abomination of non-semantic HTML, shake our heads and rant about how Adobe just doesn’t get us. As you can see, I’m really rough on Adobe, but that’s only because I know that they have the talent, resources and customer base to completely own this market and empower web developers like no one else. However, they’ve always clung to their own technologies, such as Flash, which hold the web back, not move it forward (Update: Historically, Flash served a very important and valuable purpose, but I’m unconvinced that this holds true today). I owe Adobe my career. My love for Photoshop and Illustrator pushed me into the design field, not the other way around. Never read my criticism as hate for Adobe but instead as genuine concern that one of my favorite companies could be doing a lot better than they are. It seems that Adobe might be finally coming around to the idea that they should spend less time attempting to put front end coders out of a job and more time building useful products for this huge potential user base. Slowly but surely, they’ve been testing out and releasing new experimental tools aimed right at people who actually enjoy writing HTML and CSS. This attempt has been somewhat scattered, but to fix that, all of the disparate pieces have now been rebranded to Adobe Edge Tools and Services. Good lord, they finally get it. It may have taken over a decade, but they now seem to understand that our feeble minds are actually capable of grasping this web dev stuff (who knew?). Talk is cheap though, what are they doing to fulfill this new mission? As a part of their devotion to this new mission, Adobe has put together Adobe Edge Tools and Services, a new collection of apps that is conceptually entirely separate from the all holy Creative Suite. Let’s take a look at what’s included. For all its faults, Adobe Flash brought amazing animation to the web, and that was a big step forward. Web standards and mobile compatibility have forced a new path though and it’s time for Adobe to jump on board. Edge Animate is their answer to this challenge. I have to say, this is the one that I’m most excited about. If they can pull it together, it’ll be awesome. Edge Reflow is an app specifically built to help you create responsive websites. Basically, this is a front end that helps you build the CSS for your grid. Conceptually, it seems a lot like Gridset. Unfortuantely, Edge Reflow has not yet been released, so we don’t know too much about it at this point. You can check out the teaser trailer here. Adobe Edge Code is a project that we’ve seen before on Design Shack. Also known as Brackets, Edge Code is an innovative text editor that brings a few cool new ideas to the table such as quick CSS editing right from the HTML document. Overall, my opinion in the previous review stands. There are some great ideas here and it could shape up to be an awesome editor, but for now it’s a little underwhelming for those of us who use the outstanding Sublime Text 2 every day. Adobe has a difficult battle ahead of them if they want to win over developers who depend on existing editors. This one is another app that you’re probably familiar with under a different name. Formerly Adobe Shadow, Edge Inspect allows you to easily preview and inspect your web pages on your various testing devices. Edge Inspect links together the browsers on all of your devices and synchronizes the web page and refreshes so that you can update once and see the changes everywhere at the same time. You can even press a single button to grab screenshots from all of your devices in one go. This isn’t a standalone app so much as a service that’s being integrated into products such as Edge Code, Edge Reflow and Muse. It serves up free web fonts that you can easily embed into whatever you’re working on. Really, Edge Web Font is just a new free branch of Typekit, the awesome premium web fonts service that is next on our list. This is likely the most significant product in the Edge mix, because it’s been a wildly successful app for years. Typekit was one of the first really great @font-face solutions that offered up quality professional fonts. If you’re not familiar with Typekit, you should be. With it, you can add gorgeous, cross-browser fonts to your website with a quick copy and paste. PhoneGap Build helps you create applications with standard web technologies that can then be rolled out across several platforms, including iOS and Android. This is actually part of a large movement of developers who want to forgo platform specific SDKs in favor of using standards that can be functional across all platforms. The theory is great, but in practice we’re seeing some big players like Facebook and 6Wunderkinder move away from these ideas in favor of a smoother, faster native experience. One quick note, just in case you’re wondering how you can get your hands on all of these goodies. Pretty much everything above requires a subscription to Adobe Creative Cloud. At this point, resistance is futile. Adobe is building a future where you either subscribe to their services or miss out on all the good stuff, so think twice before you purchase CS6 outright instead of leasing it through Creative Cloud. As Ryan from Adobe pointed out in the comments, these tools and services are actually available to anyone free of charge via the free tier of Adobe Creative Cloud. Cool! All of this together paints a picture: the Adobe of the future is one that embraces not only web design, but web development as well. On top of the Edge products, Adobe is actively playing a part in the web development community through open source projects and inventing new Webkit technologies. Obviously, this didn’t happen overnight. Adobe has been steadily building steam in this area for years, but they have never marketed their efforts so well as they are today. They’re making a loud and clear statement that they’re going to be a major player in the web, and not some broken proprietary version of it, the open one. Personally, I’m thrilled about this new direction. I still have plenty of doubts about how these apps will fare as individual products and whether or not any of them will prove genuinely useful in my workflow, but when taken as a unit, it’s a refreshing indication that this old school company founded on print design is finally beginning to find its footing in the web design industry. What do you think? Are you excited about the Edge Tools and Services? Is Adobe making up for years of coder neglect? Let us know in the comments below.